The permanent magnet moving coil instruments are most accurate type for d.c. measurements. The action of these instruments is based on the motoring principle. When a current carrying coil is placed in the magnetic field produced by permanent magnet, the coil experiences a force and moves. 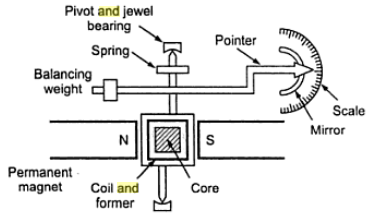 As the coil is moving and the magnet is permanent, the instrument is called permanent magnet moving coil. This basic principle is called D'Arsonval principle. The amount of force experienced by the coil is proportional to the current passing through the coil. The PMMC instrument is shown in the Fig.1. 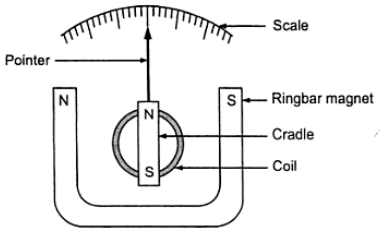 The moving coil is either rectangular or circular in shape. it has number of turns of fine wire. The coil is suspended so that it is free to turn about its vertical axis. 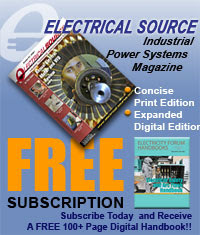 The coil is placed in uniform, horizontal and radial magnetic field of a permanent magnet in the shape of a horse-shoe. The iron core is spherical if coil is circular and is cylindrical if the coil is rectangular. Due to iron core, the deflecting torque increases, increasing the sensitivity of the instrument. The controlling torque is provided by two phosphor bronze hair springs. The damping torque is provided by eddy current damping. It is obtained by movement of the aluminium former, moving the magnetic field of the permanent magnet. The pointer is carried by the spindle and it moves over a graduated scale. The pointer has light weight so that it can deflect rapidly. The mirror is placed below the pointer to get the accurate reading by removing the parallax. The weight of the instrument is normally counter balanced by the weights situated diametrically opposite and rigidly connected to it. The scale markings of the basic d.c. PMMC instruments are usually linearly spaced as the deflecting torque and hence the pointer deflection and directly proportional to the current passing through the coil. The top view of PMMC instrument is shown in the Fig. 2. In a practical PMMC instrument, a Y shaped member is attached to the fixed end of the front control spring. An eccentric pin through the instrument case engages the Y shaped member so that the zero position of the pointer can be adjusted from outside. Note: Thus the deflection is directly proportional to the current passing through the coil. The pointer deflection can therefore be used to measure current. As the direction of the current through the coil changes, the direction of the deflection of the pointer is also changes. Hence such instrument are well suited for the d.c. measurements. In the micro ammeters and milliammeters upto about 20 mA, the entire current to be measured is passed through the coil. The springs current the coil. Thus the current carrying capacity of the springs, limits the current which can be safely carried. for higher currents, the moving is shunted by sufficient resistance. While the voltmeters having high ranges use a moving coil together with sufficient series resistance, to limit the instrument current. 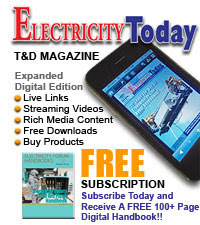 Most d.c. voltmeters are designed to produce full scale deflection with a current of 20, 10, 5 or 1 mA. The power requirement of PMMC instrument is very small, typically of the order of 25 w to 200 W. Accuracy is generally of the order of 2 to 5% of the full scale reading. 1) It has uniform scale. 2) With a powerful magnet, its torque to weight ratio is very high. So operating current is small. 4) The eddy currents induced in the metallic former over which coil is wound, provide effective damping. 5) It consumes low power, of the order of 25 W to 200 w.
6) It has high accuracy. 7) Instrument is free from hysteresis error. 8) Extension of instrument range is possible. 9) Not affected by external magnetic fields called stray magnetic fields. 1) Suitable for d.c. measurement only. 2) Ageing of permanent magnet and the control springs introduces the error. 3) The cost is high due to delicate construction and accurate machining. The friction due to jewel-pivot suspension can be eliminated by using taut band movement. The working principle of taut band instrument is same based on D'arsonval's principle. The main difference is the method of mounting the coil. In the taut band instrument the movable coil sis suspended by means of two torsion ribbons. The riboons are placed under sufficient tension to eliminate any sag. This tension is provided by the tension string. The coil is mounted in a cradle and surrounded by ring bar magnet. The construction is shown in the Fig. 3. The taut band instrument can be used in any position while jewel-pivot instrument should be used vertically. The sensitivity of the taut band instruments is higher than jewel-pivot instruments. The tau band instruments are relatively insensitive to shocks and temperature and are capable of withstanding overloads. The basic PMMC instrument is sensitive to the temperature. The magnetic field strength and spring tension decrease with increase in temperature. The coil resistance increases with increase in the temperature. Thus pointer reads low for a given current. The meter tends to read low approximately 0.2 % per oC rise in the temperature. Hence the temperature compensation is provided by appropriate use of series and shunt resistance of copper and manganin. The simple compensation circuit uses a resistance in series with the movable coil, as shown in the Fig. 4. 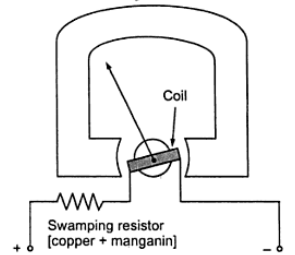 The resistor is called a swamping resistor. It is made up of manganin having practically zero temperature coefficient, combined with copper in the ratio of 20/1 or 30/1. The resultant resistance of coil and the swamping resistor increases slightly as temperature increases, just enough to compensate the change in springs and magnet due to temperature. Thus the effect of temperature is compensated. More complicated but complete cancellation of temperature effect can be obtained by using the swamping resistors in series and parallel combination as shown in the Fig.5. In this circuit, by correct proportioning of copper and mangnin parts, complete cancellation of the temperature effects can be achieved. The basic sources of errors in PMMC instruments are friction, temperature and aging of various parts. To reduce the frictional errors ratio of torque to weight is made very high. The aging of temperature magnet and control springs also cause errors. 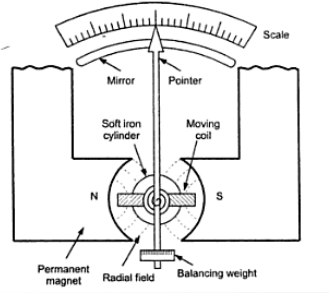 The weakening of magnet and springs cause opposite errors. The weakening of magnet cause less deflection while weakening of the control springs cause large deflection, for a particular value of current. The proper use of material and preageing during manufacturing can reduces the errors due to weakening of the control springs.